Heat a large, ovenproof stainless steel skillet over medium-high heat. Add oil to pan and swirl to coat. Sprinkle both sides of steak with salt and pepper. Add steak to pan and saute 5 minutes (or until browned) on one side. Turn steak over and bake at 425 degrees for 8 minutes. Remove from oven and let stand for 10 minutes. Combine soy sauce, rice vinegar, sesame oil, fish sauce, and chile paste. Combine basil and remaining ingredients. Drizzle dressing mixture over basil mixture and toss gently. Divide evenly between 4 plates. 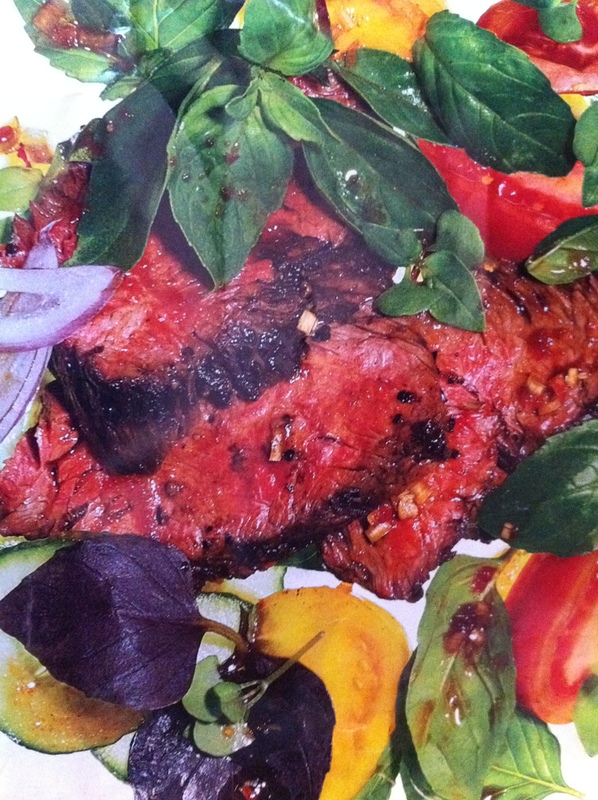 Slice steak and place on top of salad mixture. I saw this recipe in Cooking Light also! I am going to try your version this week 🙂 Thanks for sharing!